Not going to discuss the state of my sewing queue right now or all the things I WISH I had time to sew (Bonny and a Bombshell swimsuit and a Hummingbird flounce skirt and peplum dress and some Oliver + S for the little one and a top-secret project and my vintage patterns and... !). 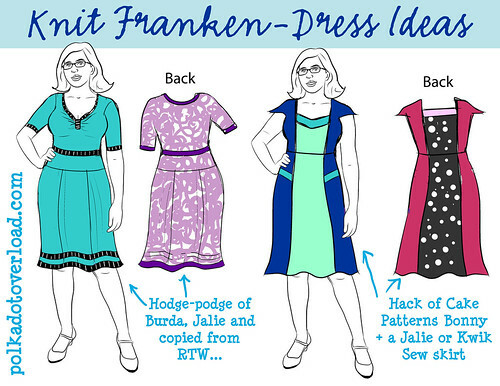 But here are some ideas that have been bumping around my head and sketchbook for colorful Franken-patterned dresses I don't even have patterns for. I love them both but am kinda leaning towards the second one (blue and green version) because color-blocking and flutter sleeves both rock my little sewing world. Which one would you sew if you were me? I love the first version! The gathered neckline is so pretty. I love the Frankenpatterns - very inspiring! I need to start combining and modifying patterns more. Well, I was just thinking... I have SO many patterns, I'm sure I could make pretty much anything if I just mixed and matched them up! I prefer the one on the left, but that is solely because I'm not a fan of flutter sleeves. Also, the straight lines on the right one feel like they're at odds with your natural body curves. What if the color blocking was just slightly hourglassed? Oooh, that's an excellent idea! I think that would definitely add a nice touch. I like the one on the left in the turquoise version. I particularly love the stripe detail, and the shape seems to suit your shape better too. Of the colour options for the right hand one, I'm afraid I like the red! Bonnie and Jalie hack, in the fuchsia and polka-dot version. Soooo pretty. Sort of off-topic, but you plan and sketch so meticulously, I wonder if, by the time it actually comes to sewing, that you feel like you've already made the dress? I do a lot of "mental" sewing and knitting, walking through all of the steps, and sometimes the actual execution becomes a little sloggy because I used up all my excitement constructing the imaginary version. ha! great question. yes, to a degree... I'm mainly an illustrator and sewing is just for fun... BUT nothing compares to actually getting to wear a creation I dreamed up on paper originally. That's the MOST fun part. All these ideas are adorable. I think the color blocking will be great. Are you at all worried about the hip seam on the first version riding up? It seems like an awkward place to join fabric, especially knits. Or maybe there's something going on there I'm missing. Alice, that's a good question... It's a feature I've seen on a lot of 40s-style dresses in pattern catalogs, but no idea if it presents a problem in actual wear!